On a quarterly basis, I always write to say thank you to the core of people that help make this website the success that it is. I start with my producer John Boitnott, who is so devoted and trusting in putting my boxing expertise together to be viewed by our many fans. Other key people that are outstanding in their contributions are: Bob Quackenbush (Proof Reader and Photo Editing), Kathy Kraft (Proof Reader), Rusty Rubin (In Rusty’s Corner), Jim Amato (Senior Boxing Writer), Tom Donelson (Member Boxing Writers Association). These are people that help and have a positive role in dmboxing.com. My t-shirt, hat, and tank top girls, who pose wearing my products, add a special touch as they contribute their beauty with class and respect. My t-shirt supplier is Isla Vista Screen Printing. Garrett Gerstenberger and Jose Cardoso offer excellent workmanship in their products, and if anybody is interested in contacting them, you may do so at (805) 845-1333 or through their website at: www.theIVSP.com. The boxing world lost a legendary historian and writer this past Sunday. Bert Randolph Sugar passed away in Chappaqua, New York from cardiac arrest, after a long battle with lung cancer. He was 74 years old. 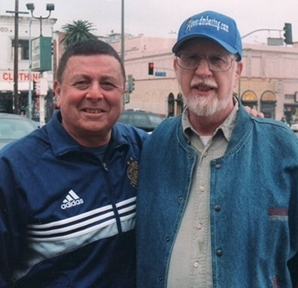 My conversations with Bert started many years ago as we both knew another boxing historian, the late Al Nelson. Bert was an expert in boxing and his favorite topic was the golden age of the sport. His top 10 fighters of all time (in order) were Sugar Ray Robinson, Henry Armstrong, Harry Greb, Jack Dempsey, Benny Leonard, Joe Louis, Mickey Walker, Sam Langford, Tony Canzoneri, and Muhammad Ali. 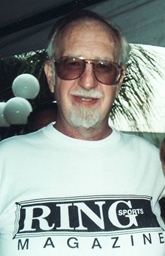 Bert was best known for being editor and publisher of Boxing Illustrated (1969-1973, 1988) and Ring magazine (1979-1983). He wrote more than eighty books and saw every major fight in the past 65 years. 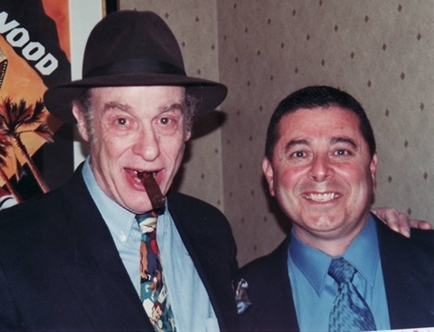 He was a colorful man and was ever present with his fedora and cigar. 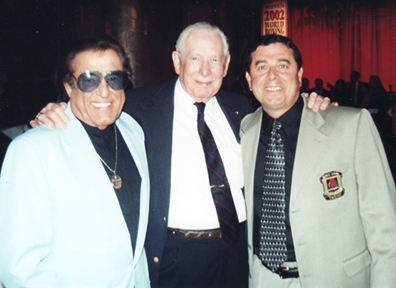 Bert was inducted into the World Boxing hall of Fame in 1989 and the International Boxing Hall of Fame in 2005. He will be missed. May his soul rest in peace with the Lord. A “capsule” look at last Saturday’s boxing! WBO bantamweight champion Jorge Arce avenged a 2009 draw with former titlest Lorenzo Parra with a 5th round knockout win in their non-title fight in Mexicali, BC, Mexico. WBC heavyweight champion Vitali Klitschko won a hard, but unanimous, decision over Dereck Chisora. The bout was held at the Olympiahalle in Munich, Germany. Paul Williams rebounded from his less than stellar performance in July 2011 against Erislandy Lara to win a one-sided 12 round unanimous decision over Japan’s Nobuhiro Ishida in their junior middleweight bout. Undefeated IBF light-heavyweight champion Tavoris Cloud reatined his title with a “controversial” 12 round split decision over former WBA champ Gabriel Campillo. The official scorecards were 116-110, 114-112 for Cloud and third card had it 115-111 for Campillo. My “unofficial” scorecard had Campillo winning the fight 114-112. 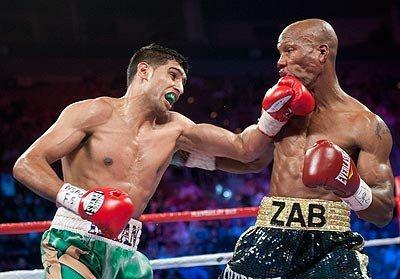 Zab Judah found himself with one more opportunity to win a big fight, this one from Amir Khan and become an elite fighter once again. At the age of 33, Judah moved down in weight to the 140 pound division but Khan would be a big fight. As for Khan, he came into the fight as the younger and bigger fighter against an older but experienced boxer who has his share of big fights. This fight happened because Tim Bradley chose not to fight Khan and Khan simply moved to the next best thing; Judah. Khan began the first round by jabbing and looking for openings whereas Judah showed patience as Khan early jabs missed. Khan long jab kept Judah a safe distance and where Judah did managed a right hook from his southpaw stance; he did very little offensively. In the second round, Judah avoided many of Khan punches, but he did very little counter whereas Khan continued to control the real estate between his opponent. By the third round, Khan physical feature started to take control but Judah managed to slip left hands but they had little effect on the bigger Khan. By David Martinez / Boxing HistorianFour years ago, July 15, 2007, I brought you this website in living color. The initial brain storming of this website I owe to John Boitnott, who approached me in early 2007 and simply told me, “Why not,” that I have all the ingredients to bring the world my love and passion of boxing. He also said that he would be honored to help me by being my producer. So, a dream became a reality and dmboxing.com was born. In these past four years I have attained much respect from a growing fan base by giving you boxing as I live it every day of my life. In addition, a unique and select group of people have bonded and given me their expertise, and they have certainly enhanced this website in what it has become today and will be in future. This week on July 2, in Hamburg, Germany, Wladimir Klitschko puts his IBF and WBO belts up against fast and hard hitting David Haye and his WBA belt. Klitschko is taller by 3 1/2” and has a 3” longer reach, but Haye does have power, although he doesn’t show much one-punch ability to take his opponent out. At 35, he’s also five years older than Haye and has fought better name fighters. The question with Klitschko in the past has been his chin, which seems to have held up well in recent fights. Being knocked out does not equate to having a glass jaw. As I see it, Haye has to wear Wladimir down in order to have a decent shot to win, and unless his legs betray him, I don’t see that happening. Klitschko by decision or late stoppage. One of the founders of the World Boxing Hall of Fame passed away. Dub Harris, also an honored veteran of WWII left us on June 21. Thanks Dub, you were one of the great guys I was privileged to meet and get to know. First, a continuing wish a speedy and full recovery to Oscar de la Hoya and Mia St. John who are both undergoing rehab treatment. This week on June 25, in Cozumel, Mexico, Tijuana native and veteran Humberto Soto takes on Motoki Sasaki, from Japan, for the WBC lightweight title. Also this week on June 25, I wish my friend and boxing historian David Martinez “Happy Birthday”. Soto, 31, 55-7-2, seems to have been around forever, but is still four years younger than the largely unheralded Sasaki, who rarely fights outside of Japan. On the surface it seems like a fight that Soto should dominate, as he has fought far bigger names than Sasaki. There is a however, here. Sasaki has fought mainly Japanese fighters, and there aren’t a lot of folks here who know their names, let alone their toughness. Still, I can’t go against the younger and more experienced Soto, especially since the fight is in Mexico. Humberto by TKO early, in what looks like a short, but action packed bout. On a personal note, I would request prayers for my wonderful wife Lois, who is dealing with a still unclearly diagnosed condition. Prayers are requested for the health of outstanding trainer Joe Sousa, who is fighting the fight of his life against cancer. Prayers for the complete return to good health to my old friend, promoter, and ex-wrestler Jack ‘Moe’ Smith who had complete reconstructive knee surgery a couple of weeks back. Moe’s a fighter and making a complete recovery. Please pray for my Aussie mates and Glove2Glove member John MacDougall, who had to deal with health problems for his wife of many years Gwen, who is in a nursing home John, a former Commissioner is having problems after a hip replacement surgery. Both need your prayers for recovery and inner strength. Please say prayers for Phill Grazide of Santa Rosa, CA. a big supporter of amateur boxing, who is suffering the crippling effects of rheumatoid arthritis. On behalf of these great fighters who have given their all in our great sport, we thank you for your ongoing prayers. If you know of any boxing people in need of spiritual uplifting and/or prayers? Just drop us a line. Membership is free to all and no one will ever contact you except for prayer requests. Your name will not suddenly appear on anyone’s mailing list. In short, there is no obligation. Every prayer request is welcome and I know the recipient will appreciate it. This past Saturday, HBO boxing after Dark had an evening of knock out boxing as the card featured knock out artists in both bouts. Adrien Broner came into the bout as an undefeated fighter with 16 knockouts in 20 wins against the tough Jason Litzau, who goes for broke. 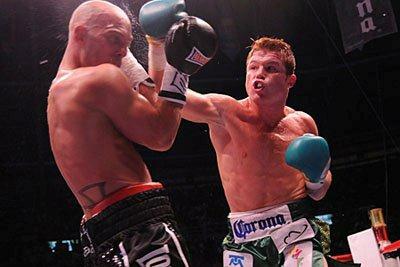 In the second bout, Mexican sensation Camelo Saul Alvarez challenged British veteran Ryan Rhodes. In the opening round of the first fight, Litzau and Broner posed more than fight as they felt each other out with little action until the last thirty seconds when Broner attacked with vicious combinations. 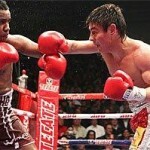 The Broner attacked began with a left hook that missed followed by a right that stunned Litzau. The right hand paralyzed Litzau for a brief moment and Litzau did not quite know where he was; Broner added a solid right, left hook, a right upper cut that send Litzau eyes rolling back and then concluded with a left hook sending Litzau down along the rope. The referee did not bother to count as it was self evident that Litzau was not going to get up. In the main event, Rhodes and Alvarez exchanged a few polite punches before Alvarez exploded with some combinations near the end of the first round as he connected on a series of combinations with the right hand showing the most pop. Alvarez showed patience in the second round as he waited to see what Rhodes, who jabbed tentatively as the memory of those stinging rights in the first round still fresh in his minds. When Rhodes turned southpaw, he proved vulnerable to Alvarez’s right as Rhodes looked ineffectual. Alvarez showed some defensive skills as he moved his head against Rhodes and avoided many of Rhodes’ punches. Alvarez occasionally would attack and never feared his opponents’ power. Rhodes started to connect on a few punches in the third round but they had little effect. Now, another thought that has crossed my little-used brain (in recent times). How about a real reality show for our over-the hill fighters who refuse to realize when the game is done? Here’s what I propose. A box-off tournament where the losers has to retire and only one of the fighters involved can remain active (or what passes in today’s boxing for ‘active’. For example Roy Jones Jr. fights Evander Holyfield with the loser retiring and the winner going on to fight the winner of Bernard Hopkins vs. Oliver McCall. It need not be confined to just four over-the hill pugilists. You can throw in your own names wherever you like. While I hate reality shows, this is one concept I would gladly support. Because getting rid of some one-time great fighters who are now little more than just an embarrassment to our sport has to be a good thing, for both the fans and the fighters. For the record, I think Hopkins easily continues to fight on.